Manuel de Falla: La vida breve: Vivan los que rien! Franz Schubert: Die schöne Müllerin, D 795/Op. 25 #2, Wohin? EMI Classics, in collaboration with the BBC, IMG Artists, and Idéale Audience International, again has released a tantalizing group of DVDs in their "Classic Archive" series. These discs "offer a unique historical glimpse into our classical heritage," and are "lovingly restored, using the finest state-of-the-art technology." 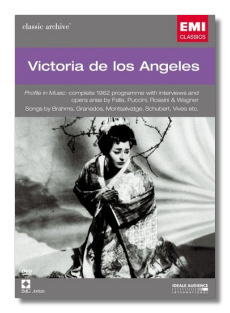 Fans of the great Spanish soprano Victoria de los Angeles need not hesitate over the DVD devoted to her: it is a treasure. The first segment, filmed in a television studio, features the soprano singing songs by Schubert (Wohin? and An die Musik), Brahms (Vergebliches Ständchen), Falla (Jota), and Vives (the mischievous El retrato de Isabela) with Gerald Moore at the piano. The year was 1957, the soprano's voice was at its freshest, and her personality at its most charming. Perhaps the Schubert and Brahms songs are a surprise for some, but de los Angeles had a huge repertoire, and her German is hardly less idiomatic than her French. The third segment was filmed at the 1967 Festival de Besançon, this time with Felix Zanetti accompanying de los Angeles. This is a tease, because here she sings only three tiny songs by Granados (El majo timido, De aquel majo amante, and El tralalá y el punteado), two equally tiny ones by Vives (El amor y los ojos and El retrato de Isabela again), and Montsalvatge's gorgeous lullaby, Canción de cuna para dormir a un negrito. Like her figure, the soprano's voice had started to spread a little by 1967, but this still is heavenly singing, and her stage manner is warm, simple, and very communicative. To hear de los Angeles sing them is to fall in love with these songs… and also with her. The "bonus" on this DVD is a film of de los Angeles singing Mompou's exquisite song Damunt de tu nomées les flors with the composer accompanying her. This was filmed in 1971 – apparently at the composer's home - and is the only color segment on this DVD. All of the songs and arias are subtitled. The quality of the sound is very acceptable throughout, although it gets better as the source material gets more recent. The "Profile in Music" and Mompou segments are the best visually, although the other two are not at all difficult to watch – just a little faded and diffuse. These performances cut right through the intervening decades. sometimes the camera is far from where one would expect it to be. (For example, at Janis's entrance in the Rachmaninoff, it is not on him but on some of the violins.) In both films, however, we are given ample opportunity to watch both Janis's hands and his face, which often seems contorted with the intensity of his music-making. If anything, the bonus material is even more impressive. Julius Katchen is another American pianist, and one who became closely associated with the music of Johannes Brahms. 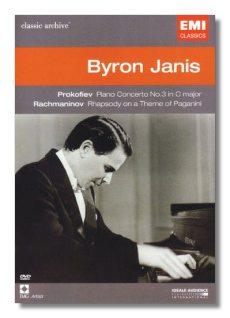 To hear and see him playing two Hungarian Dances and the Piano Sonata #2 is a rare treat. His technique is rock-solid, and his sympathy with the music in total. As the sonata progresses he becomes so drenched in sweat that it begins to roll down his face – a testimony not just to the heat of the lights in the ORTF studio but to Katchen's involvement. When the camera pays attention to his face in the second movement of the sonata, we see him with his eyes closed and in a sort of ecstasy. Hearing him play this music, our ecstasy is not far behind his. The material is all in black-and-white, and the quality of the images is tolerable. The monaural sound is equally tolerable. The unflattering balance between the pianist and the orchestra in the Rachmaninoff makes Janis's playing sound harder than it probably was. 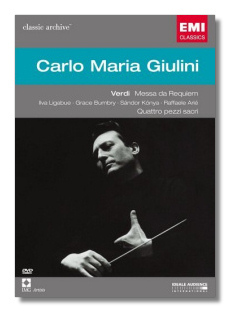 I am of two minds about Giulini's conducting, especially in the Requiem. It is hard-driven and unrelenting, much as Toscanini's was in this work. After a while, it becomes wearing; if it burns at white heat all the time, hellfire ceases to be as painful. Did Verdi really intend to put listeners in a state of panic about their souls with this work? The "Sanctus" is so fast it sounds like a whirling finale by Rossini. During the "Dies irae," when the cameras cut to the conductor, we see him flailing around and bug-eyed, like a man being electrocuted. Well, it's all very exciting, and I don't doubt Giulini's sincerity, to say nothing of his involvement with the music. It's just that I like him better later in his career, when his conducting became less physical and more cerebral. Again, the quality of the sound and of the black-and-white picture does not meet modern standards, but it certainly will not get in the way of anyone's enjoyment. The Quattro pezzi sacri, filmed in 1968 in the Fairfield Hall in Croydon, look and sound clearer, but only marginally. Earlier "Classic Archive" releases included a booklet filled with interesting notes about the performers. This time around, while the booklets remain, the booklet notes are gone, leaving only a list of track timings. Not to worry, though: if you are so inclined, you can put the DVD into your computer and read the "booklets" that way. As for myself, I spend enough time on the computer as it is, so I will be enjoying these DVDs in my DVD player, and not on my computer!